A new generation of vehicles are starting to take to the road with the expectation that their fuel source will be sustainable and provide fast, long-lasting power throughout their lifetime. With them is an array of choices for the next sustainable energy source such as batteries, biofuels, fuel cells, etc. Both batteries and fuel cells are on the road today, with the Toyota Mirai and Honda Clarity on the market as full fuel cell vehicles in California. Although these vehicles are paving the way for alternative fuels, there are still many ways to improve these technologies to make them competitive with the fossil fuels we use today. The most exciting aspect of fuel cells is that they take advantage of our most basic fuel sources, oxygen and hydrogen. With the largest benefit being the byproduct is water! As exciting and promising as this technology is, there are still barriers in energy efficiency that must be overcome. Scientists from the Center for Molecular Electrocatalysis (CME), an Energy Frontier Research Center, are tackling this challenge to make fuel cells more efficient by taking another look at the basic reactions involved. Fuel cells make energy by reacting oxygen and hydrogen to produce water (O2 + 2H2 --> 2H2O), but a possible intermediate to that reaction, that requires less hydrogen, creates hydrogen peroxide (O2 + H2 --> H2O2). We typically think of hydrogen peroxide as the liquid that stings when we pour it on cuts and scrapes, but there is a lot of energy packed into hydrogen peroxide and understanding the reaction from oxygen to hydrogen peroxide could provide a foundation for upcoming technologies based on oxygen and hydrogen fuel sources. How well oxygen and hydrogen fuel sources work is related to how much energy is required to bond them together. The way to reduce that energy is to use catalysts, which are materials that speed up the reaction and can be used over and over again. Most of these catalysts are expensive metals, such as platinum. When making commercial technologies, it is important to look beyond expensive, noble metal catalysts to materials that are more abundant and industrially feasible. 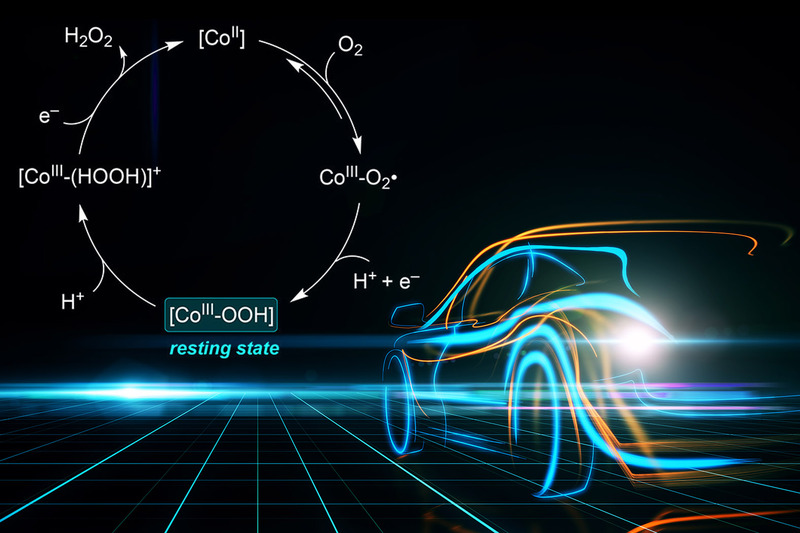 In their study, CME scientists tailored a cobalt-based catalyst to convert oxygen to hydrogen peroxide with specialized molecules. These added molecules change how the cobalt interacts with the oxygen. Choosing what molecules to bond can be difficult. Binding different molecules to metals is like downloading a new app to your phone. If you download a game like Angry Birds, your phone can let you play that game, but if you use a different app, such as Snapchat, you can send a message to a friend. Changing between apps on your phone is similar to bonding different molecules to metals because it changes their functionality. The CME team chose their specialized addition to efficiently allow for oxygen to be converted to hydrogen peroxide. Their catalyst converts oxygen to hydrogen peroxide with very little energy being put into the system, as low as a 0.09 volt overpotential. 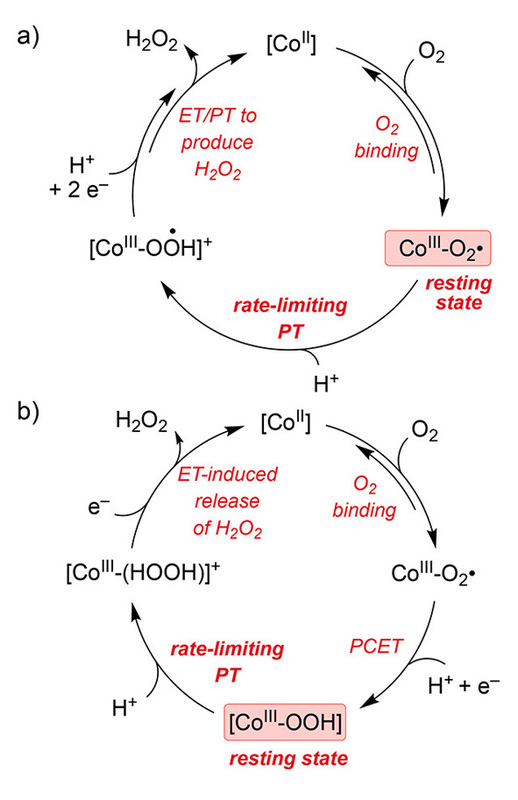 This catalytic system is also interesting, because the rate at which it would convert oxygen to hydrogen peroxide was not dependent on the oxygen concentration. Through extensive investigations, the researchers identified that the intermediate step that limited the formation of hydrogen peroxide was adding hydrogen atoms to the catalyst containing the oxygen molecules bonded to them. Using these results, the scientists are now beginning to develop catalysts able to convert oxygen to water with a similarly low overpotential. Such advances would not only add to our understanding of chemical reactions, but also could lead to improved fuel cell technology. This research was supported as part of the Center for Molecular Electrocatalysis, an Energy Frontier Research Center funded by the U.S. Department of Energy, Office of Science, Basic Energy Sciences. Z.K.G. is supported by a Blue Waters Graduate Fellowship. The authors acknowledge the National Science Foundation and the Paul and Margaret Bender Fund for support of the Electron Paramagnetic Resonance facility at University of Wisconsin-Madison. Andrea M. Bruck is currently working toward a Ph.D. at Stony Brook University, Department of Chemistry. She is a young investigator in the Center for Mesoscale Transport Properties (m2M), an Energy Frontier Research Center. Her research focuses on the fundamental processes that occur in a battery during its operation and how synchrotron-based characterization can elucidate the chemical processes that cause battery failure. Imagine never having to pump gas again. Cars are now on the market that are powered entirely by bonding together hydrogen and oxygen molecules. The reaction works well, but it isn’t as efficient as it could be. In particular, catalysts that speed up the reaction struggle with oxygen. It takes extra energy to form the right bonds with oxygen. Scientists at the Center for Molecular Electrocatalysis (CME) Energy Frontier Research Center decided to investigate. They built a catalyst with specially tailored molecules. The resulting material worked well. It formed the needed bonds with less energy. Also, the catalyst’s speed was no longer tied to oxygen levels, as most catalysts are. Insights from the study could lead to greener transportation. The CME is led by Pacific Northwest National Laboratory.